Our deck seems to be very popular to squatters. I've already talked about the Robin that built a nest and whose progeny have all flown the coop. Now we have a couple of spiders. These are interesting spiders who have interesting habits. Behaviors that I didn't know existed. I first saw them when I was taking Homer out at 10:00 pm. One of the webs extended from the deck to the hostas six to seven feet below. It was about three to four feet across. In other words, huge. I figured I would have to get rid of it but I decided to wait til the next morning. Next morning, at 7:00 am, I went out and ... the web was gone. Not a trace. I thought this was strange but I didn't think much of it until that night. At 10:00 pm the web was back in roughly the same position. The spider, which eventually grew to be about an inch or so across, had a june bug in it's web. The next morning the web was once again gone. I'd always thought that spiders built webs and then left them up. I never knew that some spiders actually removed their webs everyday. I learn something new every day. One of the spiders has stopped building its web. She's staying close to the bottom of the deck. My guess is that she's getting ready to lay eggs. I haven't decided if the egg laying is good or not. Spiders creep me out. At least they will be tidy little web spiners. Man, I hope Just A Girl doesn't see this post. She and the spiders do not have a god relationship. GH: I'd never heard of a spider that removed its web ... but now I know. 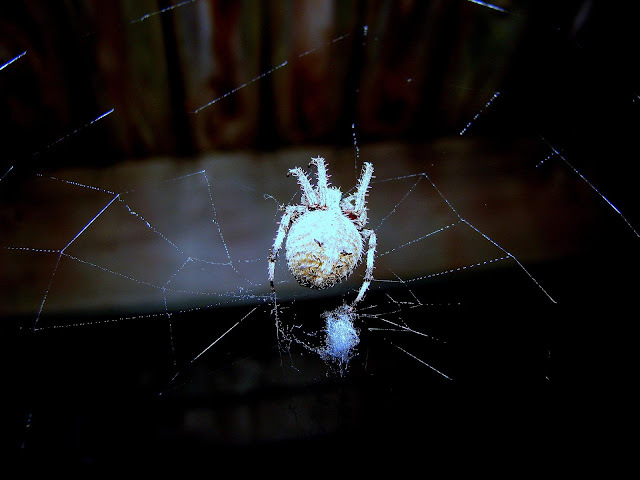 Norm: This one is particularly creepy but it still fascinated me watching it make its web each evening. Gany: Yes she is but she's still pretty gross. The Godson Cometh ... And Visit-eth. 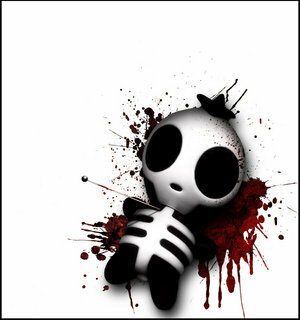 "Even If It Kills Me"